So I did a thing this past weekend. It involved vacuuming, carrying heavy stuff and honoring a hero. Do you know what I did? If you said a GORUCK Light you are correct!! I am all about trying out new things so I thought I would step out of my comfort zone and give it a go. I was so nervous at roll call I actually said to someone that I had never been more afraid in my life then I ended the day with a huge smile on my face and went home and signed up for three more! We are all used to training for our events at the gym or in the woods. Preparation for this event started with that as well but it also involved some research on the computer. A week before the Ruck we were instructed to find a Special Operations soldier who was KIA between the dates of March 14 and March 20 and be prepared to show his or her picture and speak about them. We could not choose someone who had already been claimed or we would be “punished” as a group. The group mentality had already started because we all had to make sure we communicated so there would not be any doubles. We also had to have one American flag and a 25 lb. “team weight”. I am so used to packing a regular race bag but I had no idea how to pack my Ruck. For my weight, I had to have a 20lb. Weight plus a full bladder of water, another full bottle of water, ID, a $20 bill and I chose to pack a dry bag with a change of clothes in case we got wet. Before I left my house I weighed my bag and it was 27.8 pounds. If you weigh less than 150 lbs for a light your weight has to be 10 lbs. I was so happy I invested in a chest and a waist strap because it made carrying the Ruck so much easier. And will also keep the bag from hitting you in the head during burpees. During roll call, we all had to take everything out to show the Cadre and he then taught us how to properly put everything back in. I learned a lot about how to pack a proper Ruck, turns out I had my weight in the wrong pocket. Once roll call was done Cadre Dustin, Cadre Cody, Cadre Darryl and Eric were ready to have their way with us!! 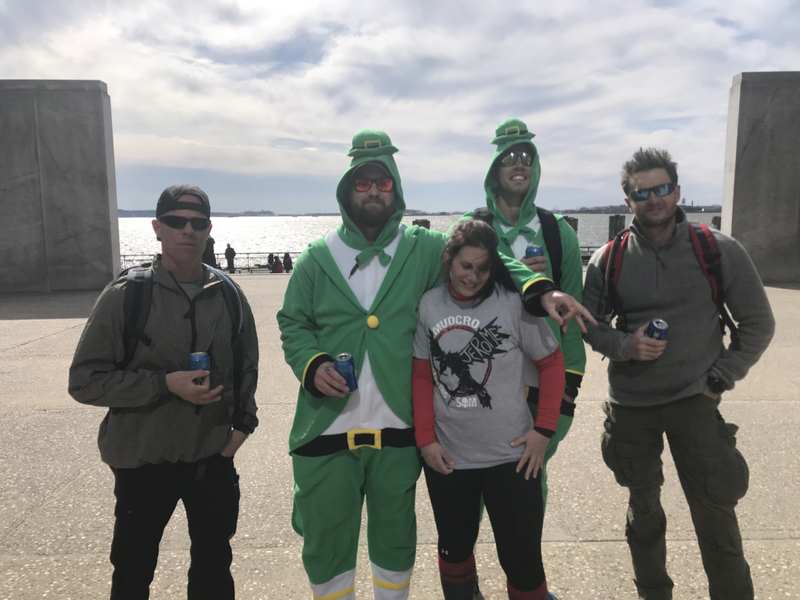 They took us on a beautiful walk/run around downtown NYC..on St Patrick Day. Which means there were even more tourists there than usual. I wish I knew how many people’s vacations pictures we ended up being in. Imagine what they thought seeing 58 people running around with big bags strapped to their backs..two people carrying American flags and some people carrying extra weights and sometimes even a person!! In addition to the “team weight” we had weights ranging from 40-90 lbs that we had to transport with us. 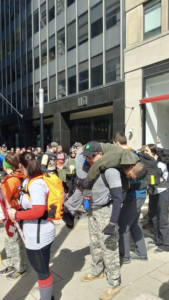 And towards the end, the Cadre would “kill somebody off” and that person became a casualty and we had to make sure they were transported and their Rucks needed to be carried to. As our service project, we went to an assisted living facility and helped clean it up. 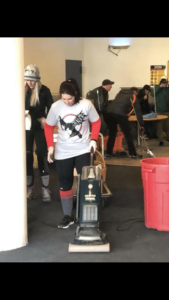 Some people cleaned the kitchen, some the garden, and others a big rec room. That’s where my vacuuming came in. When was the last time you got to do service like that during an event?? That’s why this is not a race. We all worked together towards one goal. We all moved together as one unit the entire day came together to help bring a smile to the face of the woman at the facility. She was SO APPRECIATIVE! And I think we were all thankful they let us help them out. Every time we stopped ten of us would speak about our Heros. Honoring people whose names had not been spoken in decades was something that is unique to Cadre Dustin and I am so glad he had us do that. 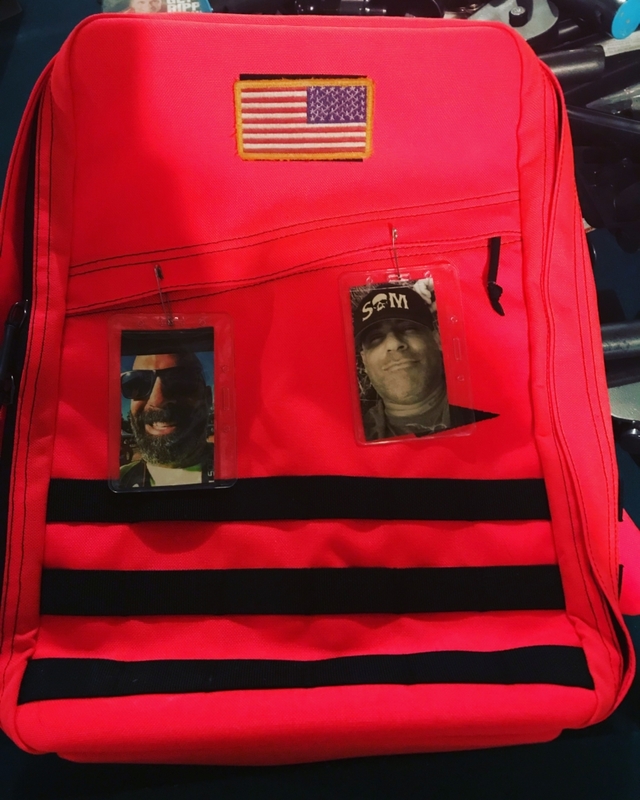 Someone even spoke about Jerome who was not a soldier KIA but he was a friend of mine and many others there who passed away at his GORUCK event last month and deserved being honored and remembered for his kind heart and a big presence in the GORUCK community. 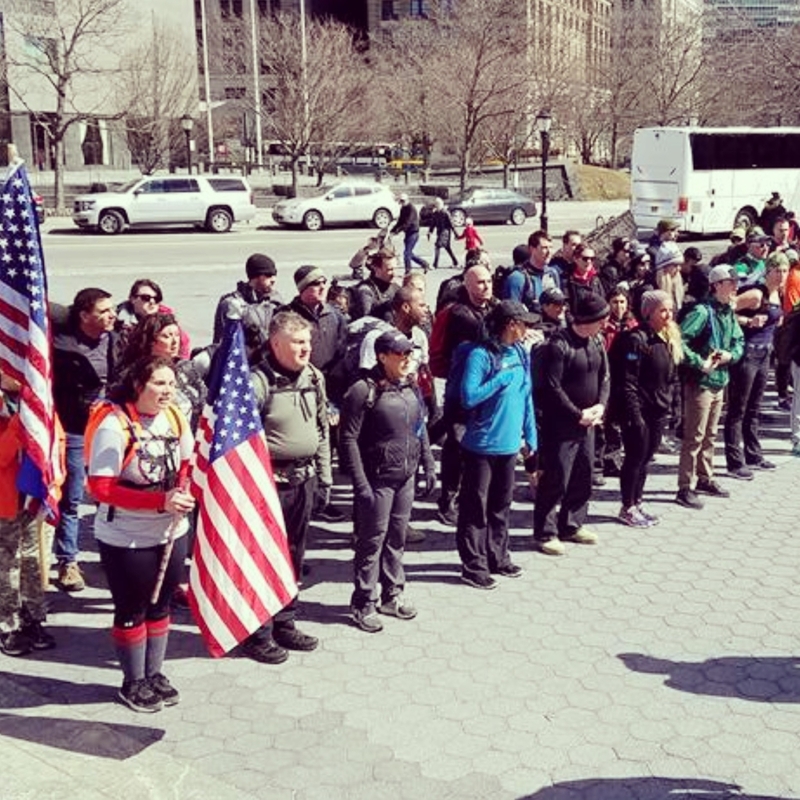 AAfter weRucked for about 7 miles we stopped in Battery Park where we started and the PT began. We rotated in groups through 4 stations doing everything from running stairs, jumping jacks, lunges, elevated push ups (with our legs on each other’s shoulders) and burpees. While wearing our Rucks! 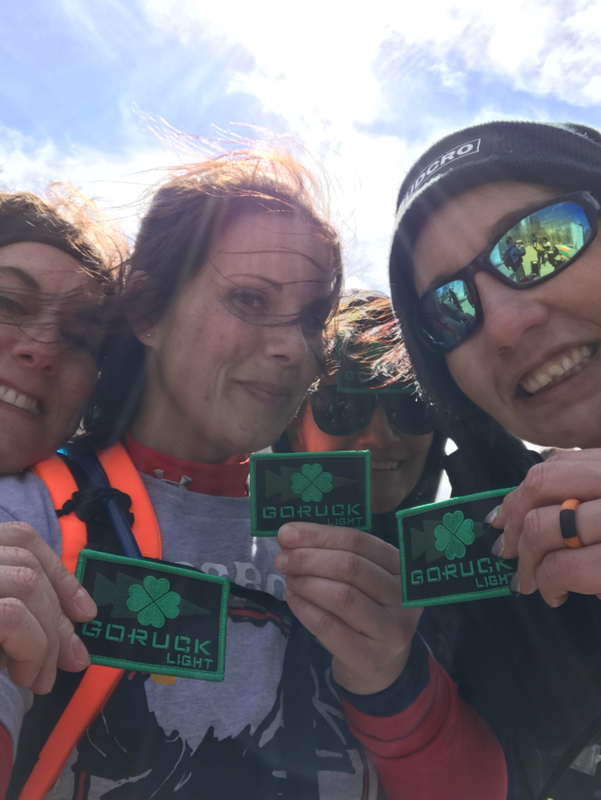 Have you done an GORUCK?